Vegan Chef. Culinary Consultant. Wellness Junkie. Margie’s mission is to create delicious and innovative ways to swap animal-based ingredients for plant-based ones wherever and whenever possible. No compromise, drama, dogma and most definitely no judgement. She believes the proof is on the plate and considers her food not only her gift, but her own peaceful form of everyday activism. Quietly standing up for the animals, the planet and the personal health and well being of the human animals she is privileged to feed. She specializes in menu and ingredient development that leave even the most committed carnivore wondering why they ever thought they couldn’t open up to new and enticing plant-powered alternatives. Always learning, always laughing and almost always cooking she is slowly but surely winning us all over to the plant side for all the right reasons, all the time. 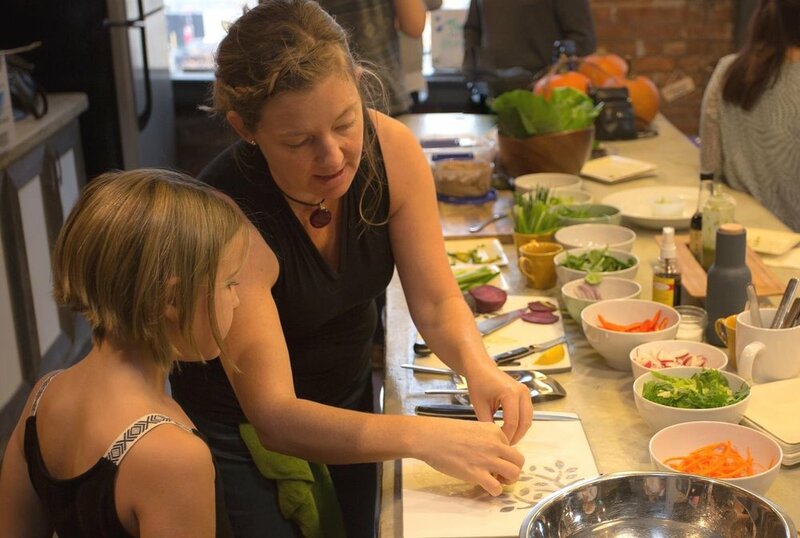 Margie Cook is also a Registered Holistic Nutritionist (RHN) and a Certified Vegan Lifestyle Coach and Educator (VLCE) through the Main Street Vegan Academy in NYC. She is married to the love of her life, the mother to four teenagers some of whom love and eat her food and the friend to a big yellow dog who literally eats and loves pretty much everything. Margie has been in the food world for what feels like her whole life. From early days waiting tables and slinging drinks all over the map to owning her own catering company to a stint in high end event planning to eventually going back to school to become an RHN (registered holistic nutritionist) to a certification in NYC at the Main Street Vegan Academy to personal chef services to teaching to corporate wellness food demos and cooking for retreats to restaurant consultation to ingredient R and D to exploring retail and home delivery possibilities she considers every single day a gift, sees every challenge as a possibility and every person she meets a treasure.